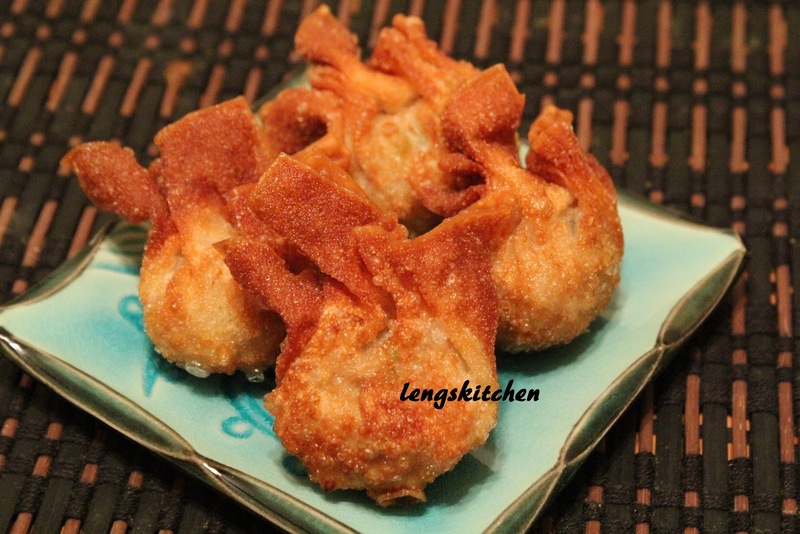 Having made some wontons, this is a continuation from the previous post Fried Wonton. Better known as Wantan Mee, the sight of a food stall selling both the soup and this dry versions of wonton noodle is almost always guaranteed in any Chinese food court alongside many others popular local favorites in Malaysia. 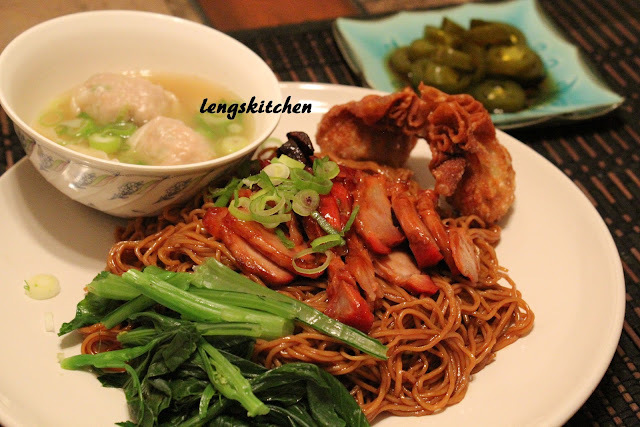 Simply fresh egg noodle tossed in a specially mixed dark soy sauce, this dry version is often served with Chinese barbequed pork (char siu), wontons in a small serving of soup and some Chinese mustard green (choy sum), complete with pickled green chilies on the side. Over time, there has been a lot more variations to this type of noodle seen. Apart from probably the most basic one featured here, some are served with roasted pork, roasted duck, braised chicken feet with mushroom, shredded chicken, fried wonton or any combination of these. Regardless of the preferred toppings, a good plate of wonton noodle is usually defined by the quality of the egg noodles used and the sauce that gives the primary flavoring to this heavenly plate of noodle. The amount to each may have to be adjusted to taste. 1. To prepare the fried garlic oil, heat up the oil in a saucepan. One well heated, turn the heat down to medium-low and add in the minced garlic. Keep an eye on the garlic. Once it shows a tinge of browning, it usually doesn't take long before they are done. Stir from time to time to ensure even heat distribution. Once they start turning golden in color, remove from heat and transfer to a heat-proof bowl and set aside for later use. 2. Wash and trim the Chinese mustard green. Have them cut into sections of about 2" in length, separating the stems and leaves. Bring a pot of water to boil and add in a pinch of salt. Begin by blanching the stems first before bringing in the leaves. Once wilted and turning slightly translucent, drain well and set aside. 3. The wontons can be served in the soup base or deep fried and served on the side. To serve with soup, bring the soup base to a boil and add in the wontons. You can tell that they are thoroughly cooked once they float onto the soup surface. Garnish with some spring onions on top. 4. In the same pot of boiling water used in step 2, loosen up the bundles of wonton noodle before adding in to the boiling water. Let cook for about 30-40 seconds and check for doneness. Give it another few seconds if it's not ready. Remove from heat with a strainer and run the noodles under cold water for about 10 seconds. Bring the noodles back to a quick plunge into the boiling water before draining it well and set on a deep dish. Repeat with the other serving. 5. To these noodles, add in the ingredients for the sauce and toss to mix evenly. 6. Transfer to a plate. Arrange on the side with some vegetables and top with the sliced barbequed pork and a couple of fried wontons (if any). Garnish lightly with some chopped spring onions. 7. 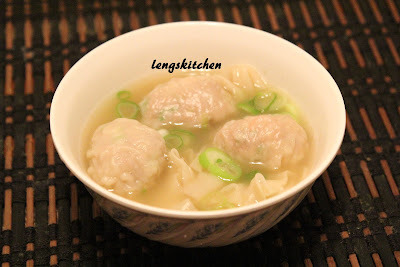 Serve with a small bowl of soup with wontons and a plate of pickled green chilies on the side. The pickled green chili that I used here was one that I found in the market by accident. 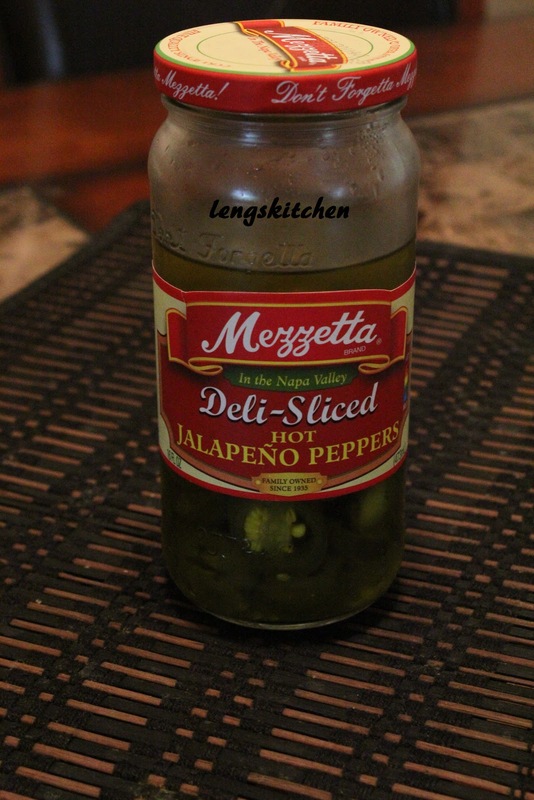 Looking for a bottle of hot peppers to go with the sandwiches that I will usually make at home, I got myself a bottle of pickled hot jalapeno for a try. On the very first taste of it upon getting home, I couldn't help thinking about how well this would complement a plate of wonton noodle, and hence its appearance here. A good match they are indeed! I came across your blog while looking for some recipes with noodles and liked a lot. How amazing! I will keep an eye on your post. Your blog has the best wonton mee I've found so far; checking out a few blogs for wonton mee. What is the best wantan noodles brand to get? Tried one that was so soggy and stuck together even though followed the instructions given on the noodles packet. Thanks in advance. Tried your receipe and the sauce is great!